BREVARD COUNTY • TITUSVILLE, FLORIDA – A Titusville Police Department Detective has been placed on administrative leave pending the conclusion of an internal affairs investigation during the arrest of a suspect Wednesday afternoon. A cell phone video surfaced on social media that captured an arrest in Titusville of 20-year-old Amari Nicholas Hair being arrested by two Titusville Police Detectives. In the video, Hair is seen in handcuffs when he is wrestled to the ground and punched after a Titusville Police Detective tells Hair to stop reaching into his waistband. “Upon seeing the video, members of command staff at the police department immediately removed the Detective from his duties and placed him on leave so that a due process investigation can be completed on the use of force during the arrest,” said a spokesperson with the Titusville Police Department. Hair was charged with Possession of Heroin, Possession of Hydromorphone, Resisting an Officer and Driving With a Suspended License. He was booked into Brevard County Jail Wednesday night and was released at 10:10 a.m. Thursday morning. “We want to assure our community that we are committed to a thorough investigation in this incident and will be completely transparent on our findings,” said the TPD spokesperson. The incident happened Wednesday and involved a police-initiated traffic stop on Amari Nicholas Hair, 20, and a 27-year-old woman, in the 3500 block of South Hopkins Avenue, near a Cumberland Farms convenience store. The officer – part of the agency’s VICE team – punched Hair at least twice in the head, leaving him with a bloodied nose, reports show. Hair, out on bond in connection to an unrelated battery charge, was treated at Parrish Medical Center, police reported. “You punched me in my face,” Hair says on the video. “Yes, I did,” the detective responded as he placed his weight on Hair. Later, a clear plastic bag was found stuffed in a pocket inside of Hair’s underwear. The package contained Hydromorphine and a white powder suspected to be heroin, police reported. “Upon seeing the video, members of command staff at the police department immediately removed the detective from his duties and placed him on leave so that a due process investigation can be completed on the use of force during the arrest,” according to a statement from the police department. 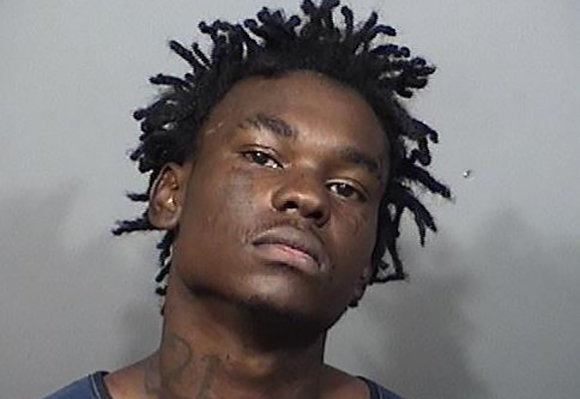 Hair posted $5,000 bail at the Brevard County Detention Center Thursday. Hair’s father, Alonzo Hair, said one of the detectives involved in his son’s apprehension has been harassing his son for the last year. The Titusville Police Department reported that its officers had repeated interactions with Hair over the last two years, including other drug-related cases. In the latest incident, an officer got out of his patrol car earlier and spotted Hair climbing over the center console into the passenger seat of a Toyota. The officer confronted the pair, including Hair who was standing outside of the car. The officer ‘quickly grabbed a hold of Amari and placed him under arrest,’ according to a police report. His girlfriend stood nearby as officers held Hair to the ground and yelled for him to stop reaching for his waistband. Alonzo Hair said his son suffered injuries to his face and back. “It’s been a horror,” the father said.